The argument is really over which of these is better, or which featured the better JA performance, or whatever. Most people would side with the American Film Institute and favor "The Sound of Music," though unbeknownst to the AFI, "Mary Poppins" is one of the great films of all time. 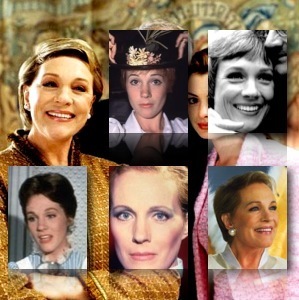 Plus, Julie won the Academy Award for "Poppins," and was only nominated for "SOM." "Victor/Victoria" is the runner-up. Then "Millie." Though she may have thought of herself as Blake Edwards's wife and star, her gift of a four-octave singing voice made her and her music-teaching-nanny role one and the same. Musical comedy. Though now she makes a stately queen both in live action and voice-over, her failure in anything but musical comedy (and only mild success with Edwards) isn't entirely due to the audience's pigeonholing her. It's just what she does. A great lover's stare, often forlorn. Mild-mannered softness one minute, then bursting out the next. The rapid-fire angry bits, usually still with a soft, cushiony voice.